Regeneration specialist Lovell has been appointed by Welwyn Hatfield Borough Council for a £45m redevelopment of the High View neighbourhood centre in Hatfield, Hertfordshire. Above is an artist’s impression showing how the redeveloped High View neighbourhood centre could look. The mixed-use scheme will revitalise the centre — which was originally built in the 1950s and is made up of a shopping precinct and other community facilities — by delivering high-quality new shops, homes and other improvements. Work is now beginning on a planning application laying out detailed proposals for the phased redevelopment which follows extensive consultations with the local community. It is expected to create in the region of 150 new homes, ranging from one-bedroom flats to three-bedroom houses. There will also be a high-quality shopping parade with 1,980m2 of retail space which will be available to High View’s existing tenants and to new businesses. The redevelopment is also set to improve access to the Jim McDonald Centre, a Council-owned community centre. 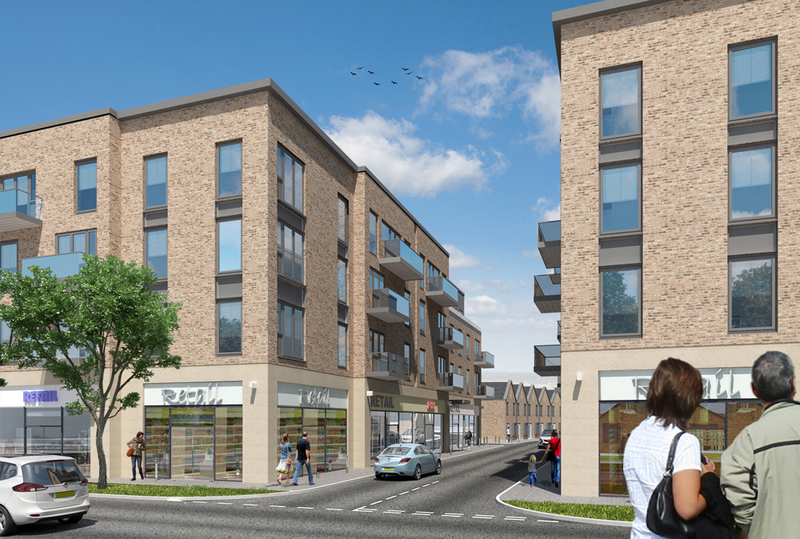 The entire scheme will be sensitively designed to be in keeping with the current character of the area. Developer Lovell, which has over 45 years’ experience in housing-led regeneration, was selected by the Council using an EU procurement process. Roger Trigg, Welwyn Hatfield Borough Council’s Executive Member for Corporate Property, said: “The absolute focus for us throughout this process has been finding the right partner to revive High View, recognising its history and place at the heart of the community. As part of its commitment to community investment, Lovell will deliver significant job and training opportunities through the regeneration scheme. These will include in the region of eight apprenticeships as well as construction-related skills courses for residents and a number of work experience placements. The regeneration specialist will also provide Welwyn Hatfield Borough Council with a £50,000 community grant for the local High View community. A planning application for the development is expected to be submitted in 2018 with the overall construction programme set to be completed in 2022.